The 4-year-old filly Tepin, who entered this season without even a stakes win, got good in the spring and even better in late summer and fall, and where most horses improve and decline as they grow and change, tire and freshen, Tepin just has kept blooming. Three weeks after winning her second Grade 1, and while facing males for the first time, she dominated a world-class field of milers and won the $2 million Breeders’ Cup Mile by 2 1/4 lengths under Julien Leparoux. Tepin, with Julien Leparoux aboard, scores by 2 1/4 lengths Saturday in the Breeders' Cup Mile. Casse came into this Breeders’ Cup with 23 starters and 23 losses, but like Tepin, this is his year. Casse won the Juvenile Fillies Turf on Friday with Catch a Glimpse, and all of his horses seem to be firing this weekend. Not even Casse could see what Tepin was on the way to becoming when she won the Distaff Turf Mile in May for her first stakes score. “How can anybody see this coming, to be the best in the world, or one of them?” Casse said. Tepin got a great trip of her own making under Leparoux, breaking on top and then settling into a perfect pressing spot racing two wide as Obviously crossed over and laid down moderate splits of 23.77 seconds for the first quarter-mile and 48.08 for the half. As well he should have been. Tepin ran along in cruise control, in the clear with Leparoux able to bide his time and dole out her speed when and where he wanted. The question for many was whether Tepin would fire again. Her course and distance win Oct. 3 in the First Lady Stakes had been so fast and come so recently that Tepin seemed like a candidate to fall back to earth, but Casse had insisted that that seven-length win had not left even a mark on Tepin’s form, and when Leparoux began asking for run at the quarter pole, the response was immediate. At the top of the stretch, the filly had surged to a lead of several lengths, Obviously left floundering, and it was obvious that no one was catching her. She strolled past the wire without having to be heavily urged, comfortably clear of the onrushing Mondialiste, and back in the winner’s circle for the fifth time this year. Tepin, the third choice, paid $11.80 to win and was timed in 1:36.69 over a “good” turf course that was playing somewhat slowly. Mondialiste, a 17-1 shot, came home 1 1/2 lengths better than Grand Arch, who won the Shadwell Turf Mile here the same day as Tepin won the First Lady. Then came Mshawish, Make Believe, Impassable, Esoterique, Tourist, Obviously, Time Test, Karakontie, and Recepta. A race that looked like it would be dominated by Europeans saw American-based horses run 1-3-4-5, and Mondialiste, the longest price of the Euros, was easily their best finisher. Trapped inside at the back of the field, he struggled to find racing room under Daniel Tudhope and came home fastest of all in a good performance, his second straight in this country, following a win in the Woodbine Mile. “Obviously, I had to sit and suffer and wait for my gaps from the rail, but he traveled around super and finished very well,” Tudhope said. Make Believe, the 5-2 favorite under Olivier Peslier, broke last and never got involved. Peslier said the slow start hurt his horse, who prefers racing near the front. “It wasn’t right for him like that,” he said. Karakontie, the 2014 Mile winner, left his race in the paddock, where he got agitated, his distress only increasing as the race approached. “To go to the start, he was stressed, a bit anxious, something not as usual,” said jockey Stephane Pasquier. Tepin’s fast start, great trip, and turn of foot left her connections with barely an anxious moment, and the win, coupled with victories in the First Lady and the Grade 1 Just a Game, could make her the champion female turf horse. By Bernstein and out of the Stravinsky mare Life Happened, and bred by Machmer Hall, Tepin won for the seventh time – this one easily the sweetest. Catch a Glimpse filled one of the few holes in the distinguished resume of multiple Sovereign Award-winning trainer Mark Casse on Friday, providing him with his first Breeders’ Cup victory in winning the Grade 1, $1 million Juvenile Fillies Turf at Keeneland. 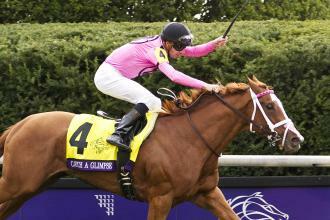 Catch a Glimps wins the Breeders' Cup Juvenile Fillies Turf by three-quarters of a length Friday at Keeneland. Casse – who entered the day 23-0-2-2 in the Breeders’ Cup before having Airoforce and Conquest Daddyo run second and fourth in the Juvenile Turf – had some anxious moments early in the Juvenile Fillies before the field hit the first turn, when Catch a Glimpse appeared in danger of getting caught in a speed duel. But once eased back off the frontrunning longshot Ruby Notion, who set splits of 24.34 seconds, 49.20, and 1:14.35, she gave off the appearance of a winner to many watching. There in a pace-pressing role in the clear, she settled kindly under Florent Geroux, easily collared the pacesetter leaving the second turn, and kicked clear in the stretch before closers Alice Springs and Nemoralia could mount threatening rallies. She won by three-quarters of a length. “Watch out – we’re just getting started now,” said a jubilant Casse, who will saddle Tepin in the Mile and Conquest Big E in the Juvenile on Saturday. While providing Casse his first Breeders’ Cup victory, she gave Geroux his second, following a win last year in the Sprint with his first Breeders’ Cup mount, Work All Week. As she did in winning two prior turf starts, including the Grade 2 Natalma in her previous race with Geroux aboard, she showed a spurt coming into the lane. “When I asked her to go, she flew home,” he said. European invader Alice Springs, the favorite at just less than 3-1 odds, came from midpack after a slow start to be second, a head in front of the third-place Nemoralia. The latter crossed the wire in front of Sapphire Kitten in fourth and Time and Motion in fifth. 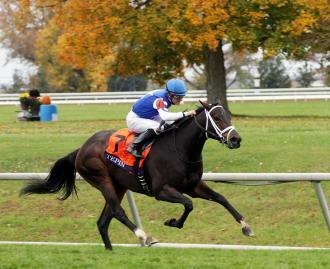 Harmonize, the most-backed U.S.-based filly, ran seventh as the 9-2 second choice in the wagering. The winner, a 2-year-old daughter of City Zip owned by Gary Barber, Michael Ambler, and Windways Farm, raced a mile on a yielding turf course in 1:39.08, just off the winning time of 1:38.86 posted by Juvenile Turf winner Hit It a Bomb a couple races earlier. She paid $14.80. Along with Casse, her victory gave Barber, a successful movie producer, his first Breeders’ Cup triumph. Asked if he felt the win could become Hollywood material, he balked. “This is storybook, a great script, but I think I’ll leave it to the racetrack,” he said. Perhaps more needs to be written, but there won’t be any more to her story this year. Casse said a rest was in order for Catch a Glimpse, likely in Ocala, Fla., where Casse winters many of his horses.